There are a number of key indicators, beyond our rising global temperature, that show Earth’s climate is changing. One of these is Arctic sea ice. Measured via satellite since the late 1970’s, the extent and thickness of sea ice tend to vary from year to year but both have been in an overall decline for decades. According to NASA, the melt season in the Arctic has increased by 37 days since 1979. Sea ice extent, the area of ocean with at least 15% sea ice, has a strong seasonal cycle. It typically peaks in March as winter ends and then declines during the summer, reaching a minimum in September. In March 2017, it hit a record low maximum for the third year in a row. The record minimum occurred in September 2012. According to the National Snow and Ice Data Center, the average age of Arctic sea ice is also changing. Thick multi-year ice – the ice that lasts through at least one melt season – has decreased 11% per decade since the satellite era began. That means there is more first-year ice, which tends to be thin and brittle. 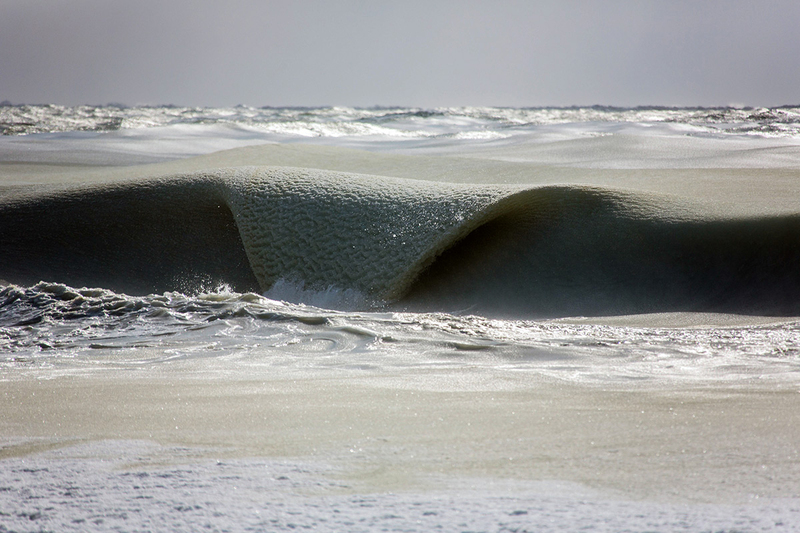 This is troublesome because it is more vulnerable to warming temperatures and wave action. Sea ice is frozen ocean water. It forms, grows, and melts in the ocean. In contrast to land ice (glaciers), it does not contribute to sea level rise. However, as it melts it creates a global warming feedback loop. Ice is lighter in color and reflects more sunlight than dark ocean water. So, as more ocean water is exposed, more of the sun’s energy is absorbed. This drives temperatures up even further and causes more ice to melt. The Arctic is now warming twice as fast as the rest of the planet – a phenomenon known as “Arctic amplification.” At this rate, scientists expect the region to be ice-free in summer by the 2030s. Most people often associate spring with flowers and mild weather. 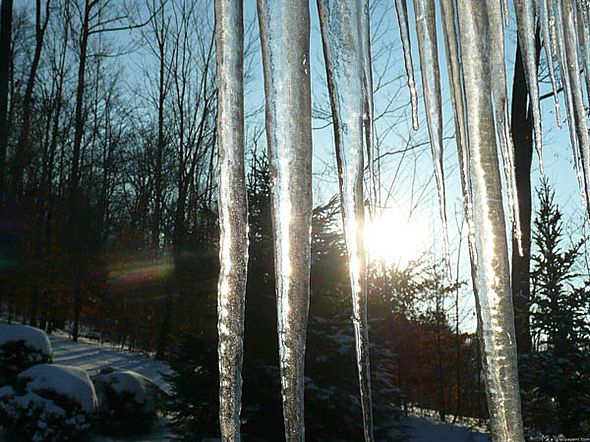 But as a transitional season, it can also produce some serious cold spells. Wearing shorts one day and a parka the next, you start to wonder when the cold will finally fade away. The answer to that question largely depends on where you live. Below is a map from NOAA that shows the typical final freeze dates across the continental US. While actual weather conditions vary from year to year, the dates shown are based on climatology – a thirty-year average of temperature data. Here in New York City, our last spring freeze usually comes in mid-April. Persistent frigid temperatures this winter across the Mid-West and Northeast have caused many rivers and lakes to freeze. These include the Great Lakes – the largest group of fresh water lakes on the planet. According to NOAA’s Great Lakes Environmental Research Laboratory, 91.8% of the Great Lakes are currently covered with ice. That is the second highest percentage on record. The largest was 94.7% in 1979. On average, peak ice coverage each winter is roughly 51%. This extensive ice cover has its pluses and minuses. On one hand, it has reduced the amount of lake effect snow – the heavy precipitation produced when cold air blows across the expansive and relatively warm lake water. When the lakes are frozen, moisture cannot be evaporated and this process shuts down. On the other hand, it has slowed shipping traffic, which has economic impacts. Also, given their massive size, the frozen lakes will likely keep regional temperatures cooler than average this spring. While this year’s ice cover on the Great Lakes is near record-breaking, researchers say the ice extent varies annually and that there has been an overall decline since the early 1970’s. 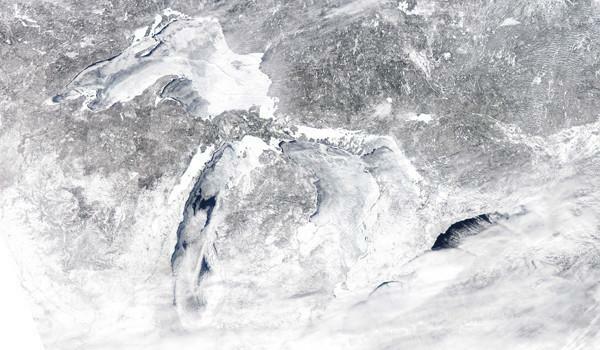 Ice covers more than 90% of the Great Lakes. 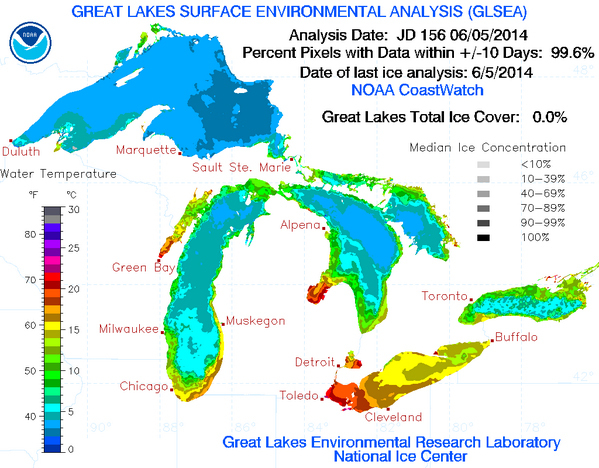 Image Credit: NOAA/Great Lakes Environmental Research Laboratory.